A group of 120 priests from Madrid’s poorest parishes criticised the state subsidies for papal “showmanship”, including tax rebates for wealthy multinationals. 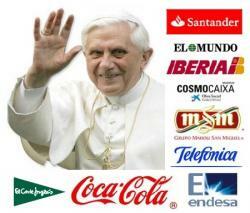 The priests blame these companies, some of them banks, for helping to cause the economic crisis. Yet the taxpayer had to pay 80% of these donations to the Pope, one of the richest men in the world, while accepting cuts in public workers’ salaries and the social safety net. The Pope visited Spain in August 2011 for the Catholic Church’s World Youth Day. 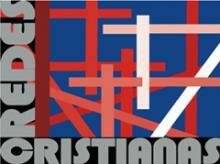 The WYD is a recurring Catholic festival held to evangelise young people. It was clear that this would face opposition, since in May the jobless rate among Spain’s “lost generation” of young people reached nearly 45 percent, a record in any industrialised country. So the question was how to get public money without adverse publicity. For previous World Youth Day the Vatican sought funding from the European Union. Perhaps feeling that this mightn’t work a second time, and that obliging the (socialist) Spanish Government to pay the whole tab might backfire, the Vatican lined up 40 corporate sponsors for the WYD in Madrid. The official WYD website showed a hierarchy of donors: Partner, Sponsor, Friend, Media Partner and 2011 Business. Only the contribution of this last, lowest level was revealed: a 2011 Business sponsor provided € 2011 per month in cash or in kind to the WYD. For this they got to polish their “corporate images” through well-publicised donations, they were invited to a private audience with the Pope in the Vatican and (depending upon one's worldview) a good investment in the hereafter. Then, through a tax rebate, they quietly got all but 20 percent of it back. This means that, in addition to all the other expenses for this religious festival to fall on the Spanish taxpayers, they also paid for 80 percent of the donations of the Pope’s corporate sponsors. The Christian Network, which brings together 147 liberal Catholic groups in Spain, has spoken out against this drain on the public purse. Their booklet about the papal visit is summarised by the following news story. The Christian Network, a liberal Catholic umbrella group in Spain, opposes state subsidies for the papal visit and World Youth Day. The group, founded in Madrid in 2005, wants to help the Catholic Church more closely follow “the style and practice of Jesus of Nazareth”. It advocates equality for women, an end to homphobia, greater opportunity for the poor, interreligious dialogue, more input from the laity and internal democracy for the Church. Criticism is being voiced about spending some 50 million euros in the midst of a crisis in order to consolidate “the privileges of the Catholic Church in a nonconfessional state”. The World Youth Day (WYD) which will take place from 16-21 August this year in Madrid is being questioned not only by atheist and secular groups, but also by the Church’s own grass-roots Christians who question the spending of “around 50 million euros” on an event “too focused on the Pope” and in the midst of a severe economic crisis. In a document published online Christian Network.Net, grass-roots Christians, are questioning devoting so many resources to “the consolidation of the privileges of the Catholic Church in a secular State like ours”, and wonder if “it would be better to invest this money in social work”. The Christian groups that make up Network reported that the WYD in Madrid “presents to young people and the world a model of the Church that still holds in the 21st century as a pyramidal structure that is not democratic”. 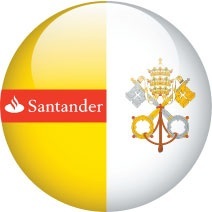 The sponsors were received in July 2010 by Benedict XVI at the Vatican. Companies that contribute to the financing of the WYD may deduct up to 80% of the funds provided, because it has been declared “an event of exceptional public interest” in the State Budget of 2010, according to Christian Network in their paper, which states that the amounts contributed to the sponsorship will be subject to tax deductions under section 27 of the Taxation Act. Christian Network also points out that the three public administrations (National, Regional Government of Madrid and Madrid City Council) have agreed to fund and ensure the safety of the event, as well as matters relating to health, cleaning and logistics, which will cost between 20 and 25 million euros. (El Publico, 11 January 2011). According to Christian Network, the Madrid Regional Government, in an agreement signed on June 22, 2010, has also offered “visitor discounts, to be determined” as well as places in “hostels, institutions and colleges”. The Spanish for World Youth Day (WYD) is Jornada Mundial de la Juventud (JMJ).